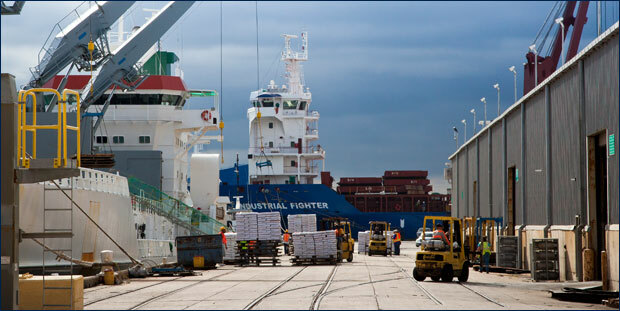 By importing and exporting cargo from around the world at its present site since 1754, the Port of Pensacola has provided local jobs and economic development not only to the city of Pensacola, but also to the Southeast region. But sadly, Pensacola's seaport is in jeopardy. Containerized cargo represents the most coveted use for the U.S Maritime industry; however, there are many other highly viable non-container uses—such as break-bulk operations, heavy equipment, automobiles, raw materials, cold supply chain, and dedicated single-use—for smaller ports, such as the Port of Pensacola, to cater to in order find their niche, capture market share and increase profitability. Smaller niche ports such as ours have major opportunities to become a feeder service to larger "hub" ports. Our seaport, with enough support, has the opportunity to work directly with shippers to network with other local ports and move cargo to and from Global Panama Hubs. The Port of Pensacola, being a niche port capable of hub and spoke activity, has six distinct advantages over larger ports: efficiency, underutilized room for growth, quick turnaround schedules, limited waterside congestion, limited landside delays, and its lower labor rates. The Port's leading commodities include cement, paper, power plant and power generation equipment, animal feed and animal feed components, construction materials and supplies, frozen cargo, and bagged agricultural products. Being along the M-10 Marine Highway Corridor has allowed the Port to help reduce major freight truck bottlenecks along the I-10 corridor, which accommodates considerable east-west freight traffic. The M-10 Corridor includes the Gulf of Mexico, Gulf Intracoastal Waterway and connecting commercial navigation channels, ports and harbors and includes Texas, Louisiana, Mississippi, Alabama, and Florida. The National I-10 Freight study shows that 400 miles of the corridor are operating at an unacceptable level of service and with traffic expected to grow significantly by 2025, now is the perfect time to shed light on the economic and environmental importance of our port. A baseline forecast from the Florida Chamber Foundation projects international waterborne freight tonnage to increase 57% over the next 25 years. The Port of Pensacola core infrastructure – such as bulkheads, berths, wharfs, and slips – is weakening. Increased support of our seaport should be a critical emphasis for key legislators, business leaders and the public. Pensacola needs to integrate and coordinate economic development, transportation and other related plans, which would encourage greater visibility and support for trade-related development and the Port of Pensacola.